This newly formed band, which features many veterans of the Connecticut music scene, manage to strike gold on their debut five song demo, which was passed along to me by one of their members. They play an intoxicating blend of indie folk, country and with a bit of sea shanty thrown in for good measure. This is dark folk music. Tales of lost souls populate the songs on this disc. Lead singer/guitarist Parker Hu sings with passion and fervor as she rails off tales of lost faith and damnation. 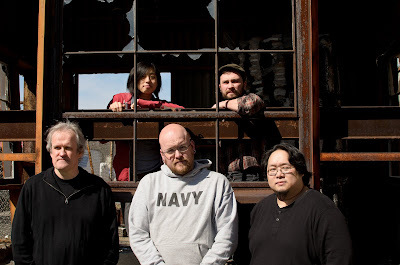 She is backed quite ably by Dan Hamilton (guitar, banjo, mandolin, vocals), Matt Futoma (percussion), Jeff Chen (cello, mandolin) and Mik Walker (bass). They provide the perfect atmosphere for these stories to reach their full potential. While each has their chance to shine, they keep it close to the vest. For this band, it's all about the songs, and they have a bunch of memorable and hook filled ones. I know there have been a whole bunch of bands coming out of the woodwork mining this kind of sound (I call this the "Arcade Fire Effect"), but this band manages to stay ahead of that pack through their darkly interesting songs. In fact, I could see them sharing a bill with the Grimm Generation, who are another local band that takes acoustic-based music to dark, transcendent places. So, you should definitely check them out.